Hardly a month goes by when another illegal maritime dumping violation is reported. Most violations, prosecuted in the United States, are based on false or fraudulent entries in the oil record book of a foreign-flag ship. Often, evidence of a “magic pipe” installation is found upon inspection in a United States port. While not all such reported cases are successfully prosecuted, most are, with the help of a whistleblower aboard the ship. The steady stream of such violations is convincing evidence that prosecution alone is not an effective deterrent. Over the years, various complaints have been made: there aren’t enough accessible reception facilities for oily wastes in U.S. ports, notably in the Gulf ports; or oily water separators are inadequate, or imperfectly understood by the vessel’s engineers. Whether or not various explanations are accepted, the big problem from the point of view of flag state and coastal state administrators is that there is no such thing as a body of reliable statistics. A British prime minister, Benjamin Disraeli, inveighed 150 years ago against “lies, damned lies, and statistics”. We’ve gotten better at gathering reliable data in years since. Today, we all think of ourselves as data wonks. As Chairman of the North American Marine Protection Association (NAMEPA), I get to hear many sea stories. As I am now about to celebrate my 40th anniversary with International Registries, I have a long historical memory of oily water separator stories. It must be remembered that MARPOL was a long time being born, and it was the almost forgotten AMOCO CADIZ wreck on the French coast in 1979 that gave the Convention, and its first Annex, the necessary push to be adopted at the International Maritime Organization. The problem is that each individual oily waste dumping case lacks the dramatic impact to bring about a more effective drive to discourage these violations. So, the dumping and the oil record book misdeeds go on … and on. Several things are needed to bring this tragicomedy of enforcement without prevention to an end. First, we need to stop kidding ourselves into believing that there is adequate access to port waste reception facilities at terminals on the Gulf coast of the United States. There isn’t. Second, federal intervention is needed to determine why this lack of effective access exists. It may well be that it is too expensive, or politically risky, to get rid of oily and other toxic/hazardous wastes once they are ashore. It may also be too expensive, because terminals charge too much. Or, it may be that terminals reserve their services for favored clients. In other words, there needs to be a federal probe. This, properly, is the job of the U.S. Department of Justice; it isn’t enough to simply prosecute a certain number of alleged MARPOL violations, and consider it a job well done. Environmental protection at sea, as ashore, can’t be a “check the box” exercise in bureaucratic procedure, even if it brings a gratifying revenue stream to Uncle Sam. We should also be concerned that by far the majority of defendants in these cases are foreign seafarers, often very far from homes and families, confined in the United States in a form of house arrest. This is not to suggest that environmental crimes should be forgiven; it is, however, important to view prosecutorial zeal with a degree of detached impartiality. In only a handful of cases has any effort been made to bring senior executives ashore to account in a court of law. We can and should be skeptical of the notion that chief engineers are saving the company they work for all those terminal discharge fees, without anyone in the executive suite knowing what’s going on. So, the merry-go-round continues, while government and industry look, just a little bit, the other way. Is it too much to ask that a thorough investigation be launched by the Environmental Protection Administration (EPA), the Department of Justice (DOJ), and the Coast Guard? All of this is another way of asking whether our laws, including OPA ’90, of which MARPOL is a part, actually work as they should. When there is a major oil spill in or around U.S. waters (see: Deepwater Horizon), it’s a federal case. 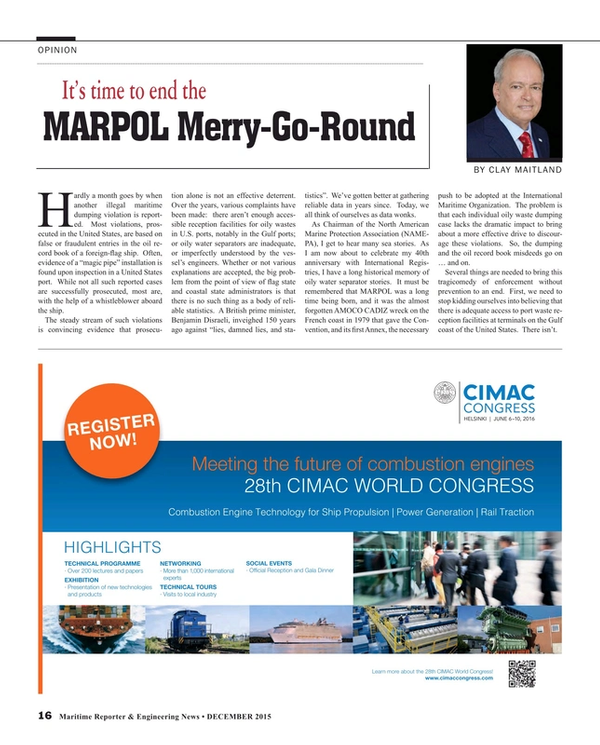 We need to make sure that the MARPOL merry-go-round is not an excuse for a business as usual attitude. Clay Maitland is the Co-Founder and Chairman of the North American Marine Environment Protection Association (NAMEPA) and Managing Partner of International Registries Inc. (the Marshall Islands Ship Registry).